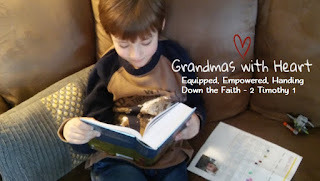 grandma's cookie jar: Grandmas with Heart Blog - Check Out the Resources! Grandmas with Heart Blog - Check Out the Resources! I am happy to say Grandmas with Heart now has an actual blog! On this blog we will be able to share more resources; something which was more challenging to do on just a facebook page, which we will keep, but will post each day on this blog information and ideas to encourage, engage, equip and empower you as you hand down the faith to the children you love. On the right side of the page you will see a list of resources - Buddy Quest is a free character-building, fun app for children from Lifetree (if you follow the link you will find the android app and if you follow the link and scroll to the bottom of the page you will find the apple link), a link for a wonderful, beautiful story Bible from Group Publishing, another free app from Group for children which will help them "meet" and get to know their friends in the Bible, information about HomeFront magazine, a link where you are able to sign up for a free daily email which will encourage you - or someone you love - who is going through a divorce and information about two books - one which provides 52 weeks of activities for you and the children you love to use to learn how to know and walk with God and the other which provides a year of Bible prayers for you and the children you love. As I said, resources to encourage, engage, equip and empower you as you hand down the faith to the children you love! We will update the links from time-to-time and will add more resources - we truly want the blog to be a valuable resource for you. And, while the blog is written by grandmas for grandmas, if you are a grandpa or parent, you will also find information and resources which will encourage, engage, equip and empower you as you hand down the faith to the children you love as well.